One Pot Chicken Feta Alfredo - everything cooks in the same pot, even the pasta! Ready in about 20 minutes!! One-pot meals are my favorite. I love that everything cooks in one skillet, and I don't have to pre-cook and pasta. 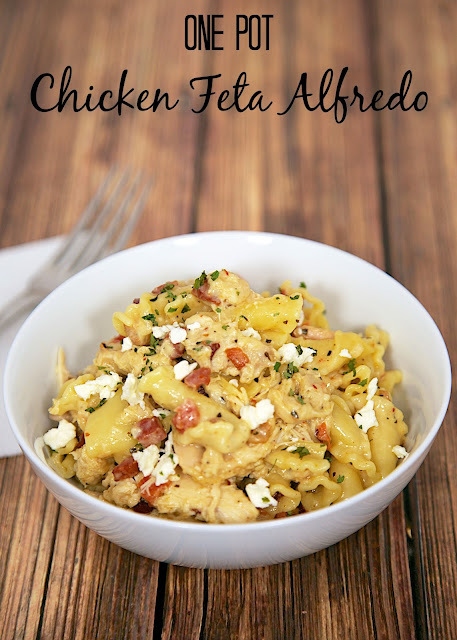 I've made a No-Boil Chicken Alfredo Skillet before, but this one is a little different. 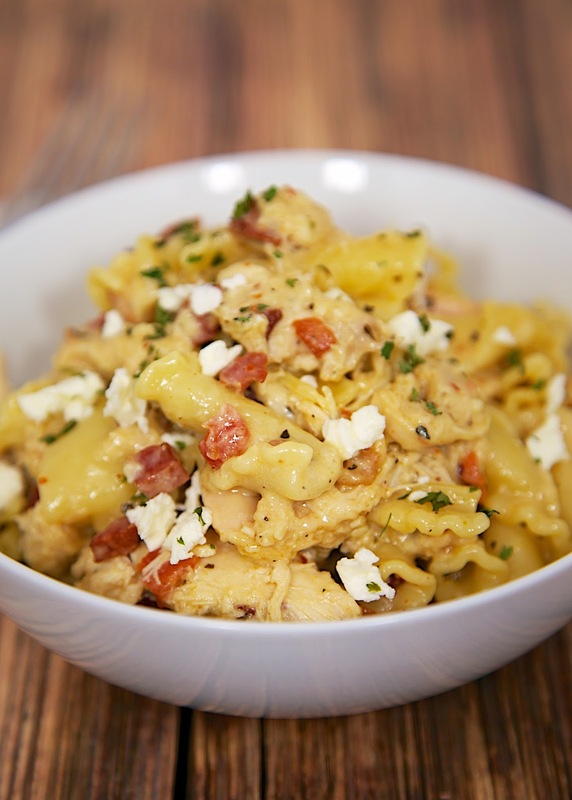 This version has pancetta, feta and tomatoes. It rivals anything I've eaten in a restaurant. I wanted to eat the whole pan myself, but I ultimately decided to share some with Chicken Legs. My grocery store sells diced pancetta in the deli department. If you can't find pancetta, you can substitute bacon. Either way, it will be delicious! In a 10-inch skillet, cook pancetta. Drain fat. Add remaining ingredients to skillet. Bring to a boil. Cover and reduce heat to simmer 15-20 minutes. I made this last night. Oh.my.gosh. It is beyond delicious!!!! I followed the recipe exactly (used bow tie pasta) and it is so good. My husband, three adult kids and I just loved it. It is great to use rotisserie chicken. I cannot over recommend trying this recipe! I want to put this on my menu for this week - have a question "shredded parmesan" is that the powdered Kraft kind or do you grate/shred 1.5 cups from a block? Thanks for the clarification! Definitely going on the menu. Can't wait! Any suggestion for substituting the heavy cream to keep lower fat and calories? I made this tonight and used fat free 1/2 and 1/2. It definitely wasn't as pretty as the pictures above (not as creamy and thick), but it was SO delicious. Both my kids loved it, too, and can't wait for me to make again. I made tonight and used fat free 1/2 and 1/2. It definitely wasn't as creamy or pretty as the pics above, but it was delicious! Both my kids loved it, too, and can't wait to have it again. Definitely a keeper! I made this last night. I did not use the pancetta and I used ½ + ½ instead of heavy cream. I found shredded parmesan cheese in the grocery store AND I used about ¾ can of petite diced tomatoes (drained) instead of the Roma. It was sooooooo good. I will definitely make this again. Stephanie, I have a question. I usually try to save recipes that I know I will used again to an app on my iPad called Paprika. It would not save it. Any way that you know that I can save it there without having to type it all out. Thanks so much for this awesome recipe. You can "Pin It" on Pinterest.com for later or you can use the toolbar on the lefthand side of the site (may be on bottom on iPad) and "YUM" it. Yummly.com is a free recipe box service. While searching, kind of by ingredients, for a meal this evening, I came across this little gem. I had these yucky frozen chicken breasts that I needed to mask so I thought I'd use this recipe. It is very kid friendly and it's good and best part, it's tweakable (is that a word yet?) Artichoke hearts come to mind as well as kalamata olives...very nice easy weekday meal...thank you.